Our conker trees are under attack! Horse-chestnut ('conker') trees have been part of our landscape for only a few hundred years [find out more]. They were planted in parks because they are such beautiful trees - wonderfully shapely, producing white 'candles' of flowers in spring and, of course, conkers in the autumn. 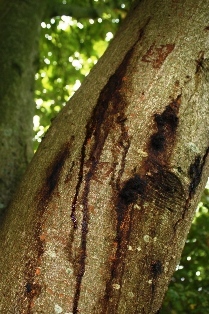 But our conker trees have recently come under attack from pests and diseases. 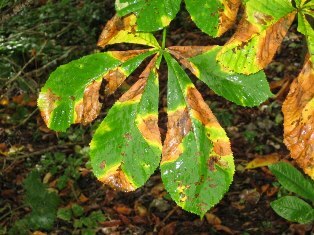 Conker Tree Science is a 'citizen science' project in which anyone can get involved in scientific research about the horse-chestnut leaf-miner moth. The main project ran for four years from 2010 to 2013. It was hypothesis-led, which means that the records that people submitted directly contributed to answering some questions about the leaf-miner moth. The first paper with thes results was published in the scientific journal PLOS ONE in 2014. One of the aims of the paper was to show that people could collect scientifically-valuable data. From 2014 onwards we have changed the project. 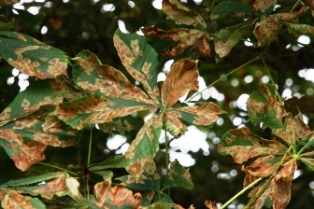 The aim of the project for now is to undertake longer-term monitoring of records of damage caused by the leaf-miner moth and also the leaf-blotch fungus.